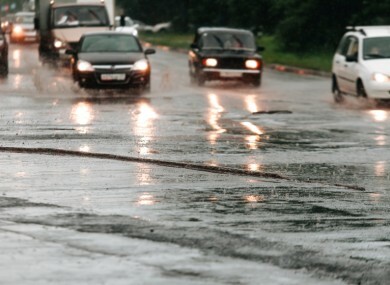 THE ROAD SAFETY Authority has warned motorists to take extra care on the roads today following a forecast of heavy rain. The RSA said that the forecast heavy rain and a risk of thundery downpours throughout the country this weekend. As this downpour will come at the end of a dry spell, it poses an extra risk to motorists. “Roads are at their most slippery when the weather breaks after a dry spell,” said Murdock. “When the weather breaks, this deposit mixes with rainwater and the road becomes hazardous. The resulting greasy road surface increases stopping distances and the risk of a skid. The sudden change in driving conditions can also catch drivers off guard. The expected rainfall and the condition of roads will make driving particularly hazardous as road surfaces become slippery reducing skid resistance. Slow down. Drive at an appropriate speed to the conditions. Don’t tailgate – Allow extra distance to the vehicle in front especially when driving behind heavy goods vehicles. Check tyres to ensure minimum tread depth of 1.6mm and ensure correct tyre pressures. Gardaí are today implementing the force’s annual ‘Slow Down day’, an intensive operation that last year detected 927 speeding offences. The operation will see gardaí running high-visibility speed checks in a range of designated ‘speed enforcement zones’ nationwide. Email “Motorists warned about 'greasy roads' as heavy rain forecast for weekend”. Feedback on “Motorists warned about 'greasy roads' as heavy rain forecast for weekend”.